The Outer Hebrides had always been a place we had longed to visit but timing was going to be everything! The crossing to and from the mainland had to be comfortable enough to enjoy and the weather had to promise to deliver sunsets and starry skies! With such high expectations we always said we would wait until the time was right………………. Easter Friday and the only plan we had was to head North of the border and stay a couple of nights in a rented cottage with family. Then there was no plan!! Until a weather window for the Outer Hebrides was spotted! Within an hour tickets were bought, excitement was through the roof and research from Eriskay to Stornoway was undertaken to ensure that every second would be maximised! The cottage was situated just outside Fort William and was a lovely place to stay! (salmon catch cottage). The view was stunning and although out of the way it was a lovely place to stay! It was time to consult the OS map and pick a nice little loop for a morning run. The loop we were looking at was about 20km. The distance prompted Jim (K's Dad) and H to jump on the bikes but the loop just had to be done and we were not disappointed! A bit on the road and then over the old military road with spectacular views. The Nephews were taken to all the usual great places to visit from the Commando Memorial to Glenfinnan, having never visited Scotland before. The four boys had a great time. The plan was to visit Eilean Donan and part company as we headed for Skye and the ferry from Uig to Lochmaddy on North Uist. Lunch overlooking Glengarry is always a must before experiencing the magic of Eilean Donan which is always visited on the way past! We were booked on the 14.00 ferry from Uig to Lochmaddy the next day so a stop at Sligachan with a short run up the glen in the morning was on the cards. We have stayed at Uig before but the view as you come over the top towards the ferry port still catches the breath! The sea was like a mill pond so smiles all round! They do say that if you are not a very good sailor then you are best reaching the Outer Hebrides from Uig as it is only 1hr 45min crossing. Once on the boat we headed on deck as tradition to watch the departure and admire the views as we left the Isle of Skye. The journey seemed really fast and it wasn't long before we were approaching Lochmaddy on North Uist. The weather was typical island weather changeable and all seasons in the space of a few hours but it didn't matter as this already felt like a magical place! Also we do live in Cumbria so rain is like food, an everyday occurrence! Armed with the numerous maps for the islands we decided to drive south and head for a campsite on the south coast. On the way we stopped at Langass Woods to stretch the legs and breath in the fresh island air! We stumbled upon the story of Hercules the Bear who went missing on the Island in 1980 for 24 days! 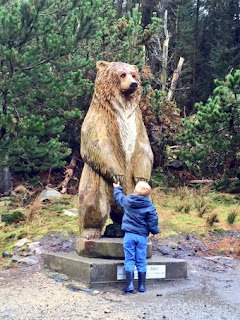 It was a very touching story and the little man was in awe of the statue! We were soon back on the road heading for South Uist and a place to stay for the night! Being more anxious with a little one we decided to call ahead to the campsite knowing we were a little early in the season to check that it was open. The gentleman that we spoke to couldn't have been more welcoming and lovely! Travelling across the causeways through Benbecula knowing we would explore more tomorrow was still an awesome experience. There was a view around every corner! We soon arrived and we were not disappointed! The facilities were immaculate and the view simply sublime across the sea to the Isle of Barra and further West to Eriskay. There was one other motorhome on the site so we were not alone. It turned out the couple next door were residents of Berneray and so we proceeded to ask them to navigate the map and tell us the must sees! They were lovely! We were getting the impression that the residents of the islands were as lovely as the views! A thought that did not change throughout the trip! Just after tea we started to look at the map again and noticed a big beach on the west coast of Eriskay which we could actually see from the campsite beach! I had a feeling we may get a sunset despite the cloud so promptly packed up and drove across to the Isle of Eriskay! What a stunning place! We parked on the upper road not to annoy the residents who lived by the beach and by the time we got to the beach the sun was dropping. The pictures will tell the rest of the story! Standing on that beach witnessing our first outer hebrides sunset was a special moment for us all! Soon we were back at the campsite bunking down for the evening and wondering what the next day will bring! An advantage of the little man getting up early is you get to catch the morning light! So an explore before breakfast was just what the doctor ordered! There was a little coastal path from the campsite beach which just had to be followed before a quick dig on the beach with the little man and breakfast! Looking at the map South Uist is spoilt for beaches in every direction. After breakfast we decided to go and explore on our bikes a beach that was a couple of km's away. There was a standing stone at the head of the beach and then it stretched out for miles. The signpost was for the Machair way. From a little bit of research this was the path through the Uists and beyond. It was soon time to have lunch and head North to Balranald nature reserve. Along the way we stopped for a few snaps of Beinn Mhor (highest on South Uist 620m) which is a must when the little man is older. The following pics should give a flavour of the trip from South Uist through Benbecula and onto North Uist. We soon arrived on North Uist and at a campsite on the edge of the Balranald Nature Reserve. It wasn't the best view from the motorhome but it was on the edge of two stunning huge beaches. The plan was not to stay here but the temptation of the walk around the reserve and the beaches was just too much so we adapted plans slightly. The lady who booked us in was again lovely and so welcoming. The site was on a working croft making it feel a real island experience. The facilities were once again top class. After a quick brew it was time to head out and explore completing the 3.75 mile walk around the reserve. It was all way marked and had amazing views at every turn. The first beach was certainly one of the most amazing we had come across. Further around the view opened up out to sea with lots to keep you interested at every turn. Towards the end of the walk we met some cows which was not ideal but we ploughed on regardless. Getting caught in a few showers didn't matter as the views soon took your mind off things and the wind blew you dry pretty quickly! At tea time the skies were clearing so we decided to head back out on our bikes to see whether we would be treated to our second Hebridean sunset! We once again were not disappointed. We put the little man in the weehoo for speed given that we would potentially ride back in the failing light! Racing back to the motorhome was great fun fuelled by the excitement of being treated to another sunset and we had only been on the island 2 days! The skies had completely cleared by now so it was time to try and capture the stars of the Outer Hebrides. The skies were just mesmerising. We just didn't want to sleep! The next morning it was time to keep heading North and catch the ferry to the Isle of Harris. The drive was spectacular in itself! We were advised to call at Malacleit on the way and look out into the extensive bay so we took a bit of a detour to do this. The next stop was Clachan Sands. We had seen a picture on one of the websites and it looked well worth a look! The road down to the cemetery and burial ground was fine for the motorhome and there was plenty of places to park. However we got the feeling that in the summer this place would get pretty busy! The views were stunning! It was time to leave the stunning views of Clachan Sands and head over to Berneray for some lunch before boarding the ferry to the Isle of Harris. We decided to head for Berneray's East beach as we had limited time. Next time we would explore the west side and the lovely dunes that we were advised to visit. The East beach was stunning and a lovely place to have lunch and a brew. The Isle of Harris felt in touching distance! The ferry from Berneray to Leversburgh was worth the trip in itself as it weaves itself between the skerries. The views were too good to sit in so out of deck we were. It was an exciting moment to arrive on the Isle of Harris having wanted to visit for so long! We were heading for Luskentyre beach which is probably the most visited beach on the island! The drive once again was spectacular with views to admire at every turn! The views back over Scarasta were amazing. We stopped to admire the view next to the golf course. This has to be one of the most scenic places to play the game? A bit challenging in the wind too! As we drove on the views were just phenomenal. There seemed to be beaches to explore on every corner. We soon realised that you must add on plenty of time to journey times to stop and admire the views and explore the beaches! "There are currently six Trust camping spots in West Harris, located in Losgaintir (Luskentyre), Seilebost (Shelibost) and Sgarasta Mhor (Scaristavore). These spots offer fantastic views and are marked with a small sign. We are asking visitors to pay £5 per night at each spot. Caravans, campervans and tents are all welcome. As a charity we will invest all earnings back into community projects, including site maintenance. More information on the Trust and West Harris can be found in our leaflet, The Machair and Beaches of West Harris, copies of which are available at each camping spot". We spent the afternoon at Luskentyre exploring the dunes, admiring the views and as always with the little man digging channels in the sand and jumping the waves! This was some beach! The dunes were huge around the beach. It was like being on a giant piste of sand. The little man had great fun jumping off and rolling down! The weather was due to get rough over night so we decided to camp at a more sheltered spot than the Harris Trust camping places as these tended to be quite exposed in places. We headed to the campsite at Horgabost. It was amongst the dunes and had toilets there. The site was closed but there was no issue staying there. When we arrived there were two people camping in tents on the dunes. It turned out they were landscape photographers and so there was plenty to talk about with them. Feeling guilty for being in the motorhome we invited them in for a brew following their evening shoot! The great thing about camping on the beach is you get to go out after tea and play and also during the dark hours if the skies are looking good! These are the moments that stay with you when things get tough! The weather did come in overnight and it was all very exciting! The forecast was spot on so we had planned to visit Tarbert and treat ourselves to a nice meal and ride the day out there. The drive was very pleasant even in the wind and rain. We always say if a place looks good in bad weather then it must be stunning! We spent time in the 'Visit Scotland' information centre planning our next few days. We then headed for lunch at the First Fruits Tearoom. It was lovely with very friendly staff and excellent food! The salmon salad was something else and a must! A chilled afternoon and tea in the Hebrides Hotel before heading back to a Harris Trust camping spot overlooking the vast sands of Luskentyre. The weather started to break in the evening so we had a lovely view as the light started to fade. This was certainly a top spot to camp! We were even treated to a starry sky again and so we played on the beach all night! The weather forecast was proving very accurate so it was good that we had planned to walk An Cliseam which was the highest point on Harris. At 799m there was a direct route that looked suitable for the little man. The start of the walk was very boggy with no real path. 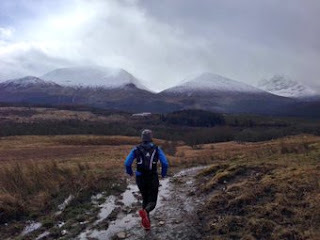 It did make it interesting trying to avoid the wettest bogs! Once up to the start of the boulders we put the little mans harness on so that he could go and explore. There was a rocky outcrop to the right of the route we were taking and most accounts of the walk tell you to take note so you do not descent over these on the way back. However as we were to learn the well worn path from the top takes you just to the left of the crags. The route was steep but nothing to worry about and the navigation was easy enough (although visibility was good). The views were stunning in every direction and it was not long before we reached the path to the summit. The weather was deteriorating and just as we were scrambling over the final boulders to the summit cairn (you can avoid this as there is a path just to the left) it started snowing! We quickly reached the summit cairn which is protected by its own little stone shelter. Snacks in the group shelter was the only thing to do at that point! The weather started to break so we made tracks back down taking in the stunning views. We picked up the path which headed more south east. Keeping the harness on the little man made us feel a bit more secure as we descended wet rock. We were soon back on the wet boggy section back to the motorhome but not without the entertainment of constant slipping on the backsides in the bog. We were paying for the heavy rain that we had had the previous day! We just laughed the whole way down and by the time we reached the motorhome we were pitted! It was great! All dried off, changed and fed we headed North to the Isle of Lewis. Our destination was a campsite on Traigh na Beirigh just off Cnip (GR 101360). The drive was as stunning as we had seen. The road around the Cnip peninsula was quite narrow and I would not have wanted a bigger motorhome! This area is popular for surfing and you can see why! We arrived at the campsite to find that it was closed for 2015! However there was a place outside to camp and the toilets had a shower with access to water so happy days!! We had the place to ourselves! Having spent the afternoon on the beach it was tea time before venturing out for the sunset and further exploration of the extensive sands! We were not disappointed! The view North West reminded us of something off Pirates of the Caribbean! We arrived back at the motorhome buzzing from one of the best days. There was just too much to take in and savour sometimes! This place was very special! The drive from Cnip to Uige sands was only a few miles so it was not long before we were exploring the extensive beaches! The facilities at the campsite which were community owned were stunning yet again! Lovely showers (20p for 2 mins or £1 for 10 mins) . There was a utility room for washing up and this also had all the information about the site. The cost was £2 per person so for £6 we were treated to a fantastic camping facility! The plan was to have lunch and ride to Mangarstadh. However the weather was a bit wet so we decided to drive and have a walk. There was a small grassy area to park and interestingly there were wigwams in the village that people rent out! We walked towards the sea and the view that was in front was magnificent. The power of the Atlantic was certainly on show! Our aim was to find the Mangarstadh bothy which had a been a place we had always wanted to visit having watched Alistair Humphrey's inspiring film about Bothy's and Bikes. We only had a picture to go on so by the time we matched all the landscape up and had a good explore time was ticking on (put it this way we missed lunch!). I am not going to give directions as that is up to the explorer to find. 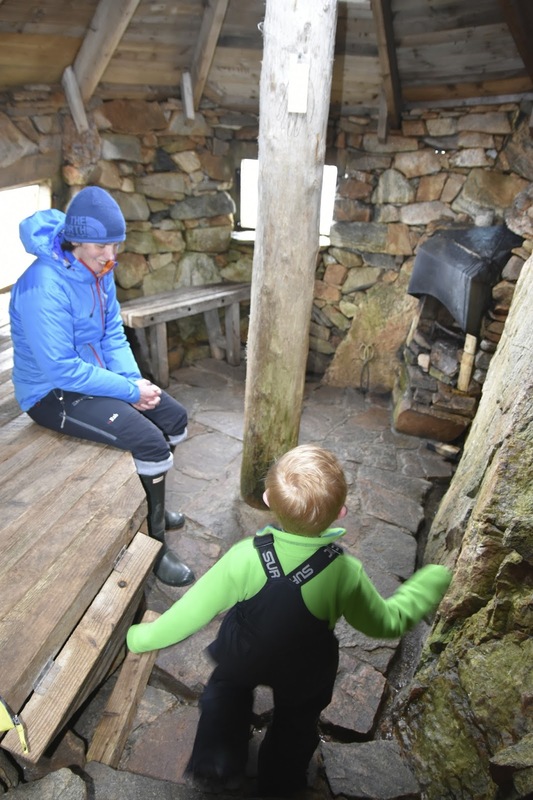 The most significant thing about this bothy is the story behind it. It was built in an inspiring place in memory of an inspiring person! Linda Norgrove was an aid worker in Afghanistan and was kidnapped in 2010 and died in a rescue attempt. You can stay a night in the bothy but you must inform the Norgroves in Mangarstadh. Details are in the bothy. We had a well earned mars bar in the bothy and sat in silence to listen to the Atlantic booming below! The bothy is immaculate and would be an awesome place to spend the night! It was soon time to head back for tea and a play on the beach! This had been a very special place! After tea the weather had still not improved but we headed out to explore the extensive sands of Uige. Another great day in the Outer hebrides. This was our last night on the Islands! The day we were dreading had arrived! We were to head to Stornoway for the 14.00 ferry. We left Uige with a very heavy heart! On the way out of the campsite there was a statue for the chessmen that had been found in the area. Looking back at the beach on the way to Stornoway we vowed that we would be back! On the way back we visited the Callanish standing stones and had a brew in the lovely visitor centre. Arriving at Stornoway we were a bit overwhelmed by the amount of cars and people having seen very few over the past week. It took all the will power not to turn the motorhome around and just keep driving! Taking the mature adult approach we parked in the terminal and walked to Lews castle. We only wished we had had more time to explore! Once on the boat we watched as Stornoway faded in the distance. The Calmac ferry was very cool and you could tell that it was built for weather! The crossing was 2hr 30 mins to Ullapoool. We had just finished having lunch when the captain announced that the coastguard will be practising winching on and off the ferry! As you can imagine we rushed to get front row seats! They were amazing to watch and the respect we already had for the service they provided only grew! The weather was getting worse as we approached the mainland. Loch Broom was stunning as we sailed towards Ullapool. Soon it was time to disembark and head for the night at Aviemore before heading back to Cumbria. It had been an inspiring week in an inspiring place and one thing is for sure we will return and in the future we will be living there! Choose your weather window if you can. If you can't pack waterproofs and plan around it. There is still plenty to see and do even in bad weather. There are many OS maps needed for the islands but they are worth getting to pick the best bits to explore. Travel around to give yourself the best chance of seeing many parts of the Island. Campsites are few and far between on Harris so don't expect luxury and be prepared to wild camp. Stock up on food and gas to save you having to spend time on essentials. Very few places on Harris although many Co op's on the Uists. Plan your fuel we just made sure we were well stocked. Roads can be narrow but we had no issue even with the motorhome (6.1m long). 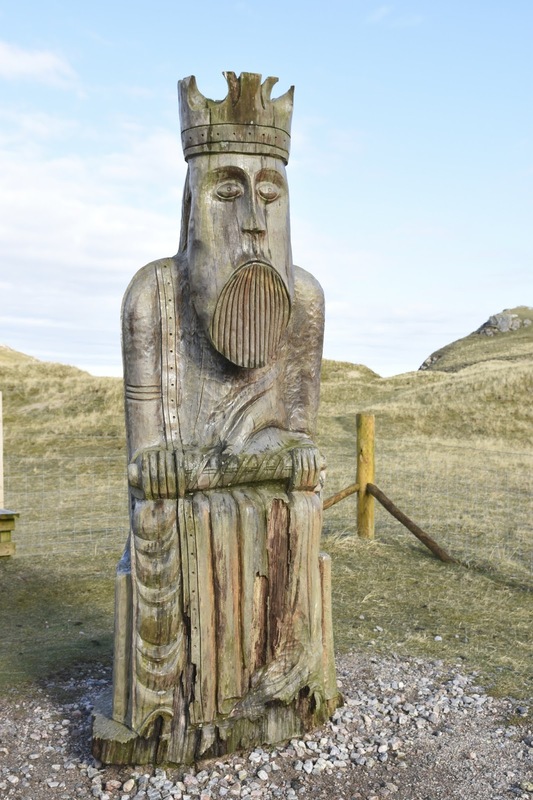 If you don't like long sailings go from Uig on Skye. Explore at night and day as the stars were amazing! Give yourself a week to clean the sand out of the motorhome…but its worth it! Be prepared to never want to leave! Make sure someone is on resignation watch when you return!